The Itty Bitty Kitty Committee: Little Ones Are Now Officially "Big"
Little Ones Are Now Officially "Big"
Yesterday I loaded up the Dinichi Family into the kitty carrier and we headed down to the Humane Society for weigh-ins and a round of vaccines. The kittens were so good in the car and I literally didn't hear a single peep until we turned into the shelter parking lot. 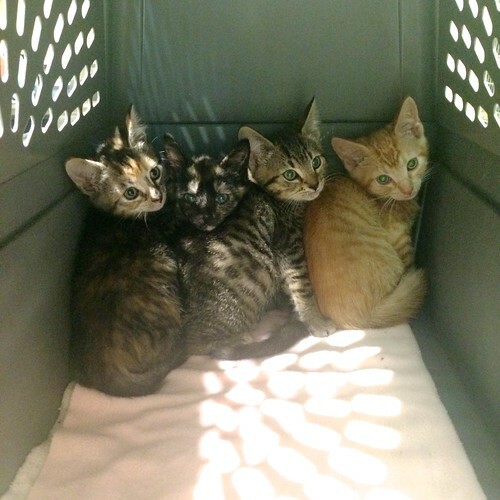 When we popped open the carrier in the foster room, the photo above is what we saw -- four little scaredy-kittens clinging to the back wall of the carrier. We fished them out, one at a time, and everyone had their turn on the scale. Tegan was the smallest, and weighed in at 2.1 pounds. Nicholas was the largest at 2.6 pounds. They all did great with their shots and seemed happy to get a little loving from Sarah, who's in charge of the foster program. SO, yes, everyone has now officially made weight! They're on the surgery schedule and soon our Dinichi's will be departing! They were so teeny when they moved in, so their stay has been longer than average. We've witnessed many kitten milestones, watched them grow, and saw their personalities take shape. It's going to be very hard to say goodbye to this dear batch. But that's part of the deal, isn't it? Thankfully, they all have stellar families anxiously awaiting the arrival of their dear kittens, and knowing that, makes letting go of them possible. Okay- that is enough to drag some tears from my eyes. I am so attached to this litter- and no offense to the little dudes- but the girls have taken my heart. I am going to really miss Tegan and Dinah. What adorable girls! I can't wait to hear the adoption tales. Everyone who adopts an IBKC alumnus/alumna is lucky, but I will be particularly jealous of the people who bring Russell home. I just love them orange tabbies, particularly when they have mittens on. What am I to do without my daily Taters??? Russell & Tegan's mitts are adorable, Nicholas's serious face too and then there is Dinah's elfin face...But Orange Tiger boys with catcher's mitts are my weakness. Next to long haired orange boys. Hooray for adoptions! I can't wait to hear their stories and who got matched with whom! With the Olympics, I'm going to miss seeing them with their gold medals more than usual. Well progress marches forward and all that. Thank you for taking such good care of this litter. All kittens are sweet, but this has really been a special bunch. I hope they are going out in pairs! I'll hate to see them go! We will get to see some of their 'growed up' stories someday, so I can cope. These are lovely kittens, err cats. My mom would definitely love to hug them.